Los sistemas argumentativos formalizan razonamiento de sentido común mediante la construcción, comparación y evaluación de argumentos a favor o en contra de ciertas afirmaciones. En tales sistemas existen dos nociones centrales: derrota y defensa. En el presente trabajo caracterizan ambas nociones y se discuten algunos desafíos para las caracterizaciones propuestas. Además, se realizan algunos comentarios al respecto. Profesor Titular de Lógica y Epistemología de la Universidad Católica de Cuyo. Becario Postdoctoral en el Instituto de Investigaciones Económicas y Sociales del Sur - CONICET. Doctor en Filosofía por la Universidad Nacional del Sur, Argentina. Sus principales áreas de trabajo y de investigación son lógica filosófica, representación del conocimiento y razonamiento y argumentación rebatible. Alessio, C. A. (2015). Restablecimiento y especificidad en sistemas argumentativos. Doctoral dissertation: Universidad Nacional del Sur. Amgoud, L., & Cayrol, C. (1997). “Integrating preference orderings into argument-based reasoning”. In Qualitative and Quantitative Practical Reasoning (pp. 159-170). Springer Berlin Heidelberg. Amgoud, L., & Cayrol, C. (1998, July). “On the acceptability of arguments in preference-based argumentation”. In Proceedings of the Fourteenth conference on Uncertainty in artificial intelligence (pp. 1-7). Morgan Kaufmann Publishers Inc.
Amgoud, L., & Vesic, S. (2009, July). “Repairing Preference-Based Argumentation Frameworks”. In IJCAI (pp. 665-670). Benferhat, S. (2000). “Computing specificity in default reasoning”. En Gabbay, D.M. & Smets, P. (Eds.) Handbook of Defeasible Reasoning and Uncertainty Management Systems (pp. 147-177). Springer Netherlands. Bodanza, G. A. (2015). “La argumentación abstracta en Inteligencia Artificial: problemas de interpretación y adecuación de las semánticas para la toma de decisiones”. Theoria: an international journal for theory, history and foundations of science, 30(3), 395-414. Bodanza, G.A. & Alessio, C.A. (2010) “Sobre la aceptabilidad de argumentos en un marco argumentativo con especificidad”. Actas de la II Conferencia Internacional Lógica, Argumentación y Pensamiento Crítico (pp. 74-81). CEAR.Santiago, Chile. Bodanza, G.A. & Alessio, C.A. (2014). “Reinstatement and the Requirement of Maximal Specificity in Argument Systems”. Logic, Language, Information, and Computation: 81-93. Bodanza, G. A., Tohmé, F., & Simari, G. R. (2012). “Argumentation Games for Admissibility and Cogency Criteria”. En Verheij, B., Szeider, S., Woltran, S. (Eds.) Computational Models of Argument. Proceedings of COMMA 2012 (pp. 153–164). IOS Press. Chesñevar, C. I., Maguitman, A. G., & Loui, R. P. (2000). “Logical models of argument”. ACM Computing Surveys (CSUR), 32(4): 337-383. Dung, P.M. (1995). “On the acceptability of arguments and its fundamental role in nonmonotonic reasoning, logic programming and n person games”. Artificial intelligence, 77(2): 321-357. Fuentes Bravo, C., & Santibáñez Yãnez, C. (2014). “Toulmin: razonamiento, sentido común y derrotabilidad”. 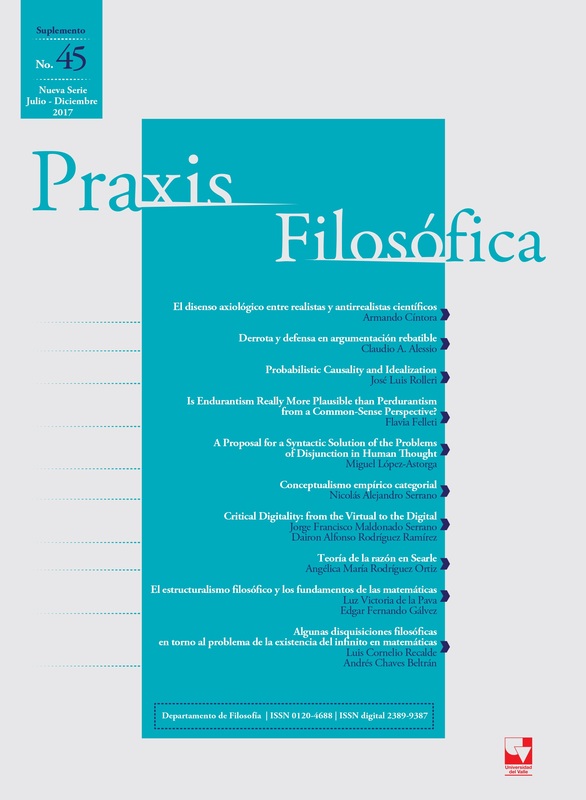 Kriterion: Revista de Filosofía, 55(130): 531-548. García, A. J., & Simari, G. R. (2004). “Defeasible logic programming: An argumentative approach”. Journal of Theory and Practice of Logic Programming, 4 (1-2): 95-138. Horty, J. F. (1994). “Some Direct Theories of Nonmonotonic Inheritance”. In: Gabbay, D., Hobber, C., Robinson, J. (eds.) Handbook of Logic in Artificial Intelligence and Logic Programming. Nonmonotonic Reasoning and Uncertain Reasoning, vol. 3 (pp. 111–187). Oxford University Press. Horty, J. F. (2001). “Argument construction and reinstatement in logics for defeasible reasoning”. Artificial Intelligence and Law, 9(1): 1-28. Horty, J. F. (2012). Reasons as Defaults. Oxford University Press. Horty, J. F., Thomason, R.H., & Touretzky, D.S. (1990). “A skeptical theory of inheritance in nonmonotonic semantic networks”. Artificial intelligence, 42(2): 311-348. Kyburg, H. (1983) “The Reference Class”, Philosophy of Science, 50. Koons, R. (2014). “Defeasible Reasoning”, En Edward N. Zalta (ed.) The Stanford Encyclopedia of Philosophy. Lehrer, K & Paxson, T. (1969). “Knowledge: Undefeated Justified True Belief”. Journal of Philosophy, 66: 225-37. Loui, R.P. (1987). “Defeat among arguments: a system of defeasible inference”. Computational intelligence, 3(1): 100-106. Modgil, S., & Prakken, H. (2013). “A general account of argumentation with preferences”. Artificial Intelligence, 195: 361-397. Plantinga, A. (2000). Warranted Christian Belief. New York: Oxford University Press.Plantinga applies his externalist theory of warrant and proper function to questions regarding the positive epistemic status of Christian belief. In chapter 11 Plantinga provides a more developed account of his view of rationality defeaters earlier introduced in Plantinga 1993a. Pollock, J. L. (1987). “Defeasible reasoning”. Cognitive science, 11(4): 481-518. Pollock, J. L.(1994). “Justification and defeat”. Artificial Intelligence, 67(2), 377-407. Pollock, J. L. (1995). Cognitive carpentry: A blueprint for how to build a person. MIT Press. Pollock, J. L. (2001). “Defeasible reasoning with variable degrees of justification”. Artificial Intelligence, 133(1): 233-282. Poole, D. (1985). “On the Comparison of Theories: Preferring the Most Specific Explanation”. En Joshi, A.K. (Ed. ): Proceedings of the 9th International Joint Conference on Artificial Intelligence (pp. 144-147). Los Angeles, CA. Morgan Kaufmann. Prakken, H. (1993). Logical Tools for Modelling Legal Arguments. PhD thesis, Vrije University, Amsterdam (Holanda). Prakken, H. (1997). Logical Tools for Modelling Legal Argument. A Study of Defeasible Reasoning in Law. Dordrecht etc. : Kluwer Law and Philosophy Library. Prakken, H. (2002). “Intuitions and the Modelling of Defeasible Reasoning: Some Case Studies”. En Benferhat, S., Giunchiglia, E. (eds.) 9th International Workshop on Non-Monotonic Reasoning (pp. 91-102). Tolouse, France. Prakken, H. (2011). “An overview of formal models of argumentation and their application in philosophy”. Studies in Logic, 4(1): 65-86. Prakken, H., & Sartor, G. (1996a). “A dialectical model of assessing conflicting arguments in legal reasoning”. Artificial Intelligence and Law 4: 331-368. Prakken, H., & Sartor, G. (1996b). “A system for defeasible argumentation, with defeasible priorities”. En Gabbay, D.M. & Ohlbach, H.J. (Eds.) Practical Reasoning, International Conference on Formal and Applied Practical Reasoning (pp. 510-524). Bonn, Germany: Springer Berlin Heidelberg. Prakken, H., & Sartor, G. (1997). “Argument-based extended logic programming with defeasible priorities”. Journal of applied non-classical logics, 7(1-2): 25-75. Prakken, H., & Vreeswijk, G.A.W. (2000). “Logics for defeasible argumentation”. En Gabbay, D. M. & Franz, G. (Eds.) Handbook of philosophical logic, Vol. IV (pp. 219-318). Springer Netherlands. Simari, G.R. & Loui, R.P. (1992). “A mathematical treatment of defeasible reasoning and its implementation”. Artificial intelligence, 53(2): 125-157. Sudduth, M. (2008) “Defeaters in Epistemology”. In Fieser, J. and Dowden, B. (Eds.) Internet Encyclopedia of Philosophy. Tohmé, F. (2002). “Negotiation and Defeasible Decision Making”. Theory and Decision, 53(4), 289-311. Vreeswijk, G.A.W. (1993). Studies in Defeasible Argumentation. Doctoral dissertation: Free University Amsterdam. Vreeswijk, G.A.W. (1997). “Abstract argumentation systems”. Journal of Artificial Intelligence, 90: 225-279. Vreeswijk, G. A. W. & Prakken, H. (2000). “Credulous and skeptical argument games for preferred semantics”. En Ojeda-Aciego, M., de Guzmán, I.P., Brewka, G. & Moniz Pereira, L. (Eds.) Logics in Artificial Intelligence, European Workshop, JELIA Proceedings , (pp. 239–253). Springer. Walton, D. (2011). “How to refute an argument using artificial intelligence”. In: M. Koszowy (ed. ), Argument and computation, Studies in Logic, Grammar and Rhetoric, 23(36): 123–154. Weisberg, J. (2015), “Formal Epistemology”, En Edward N. Zalta (ed.) Stanford Encyclopedia of Philosophy.